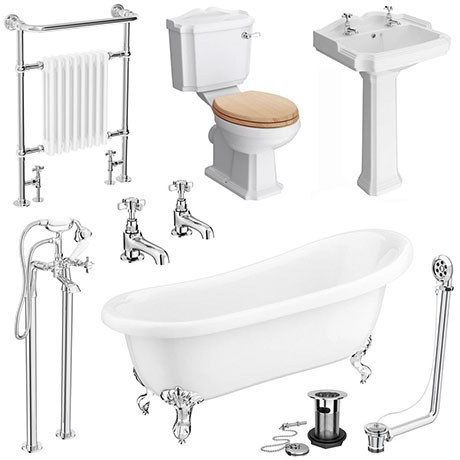 The Winchester Traditional complete roll top bathroom package (1710mm) includes everything you need for creating a stylish bathroom in your home. Evoking the classical style of a bygone era, yet manufactured to today's high exacting standards, the high quality Winchester bathroom suite is perfect for providing a period look in any home. Includes a luxury traditional free standing roll top slipper bath and Traditional Savoy Heated Towel Rail. Designed to allow you to fit a Bath Shower Mixer, or Bath Filler over the edge of a Free standing Bath which has no tap holes.